Babblings of a Mommy: Starbucks Bistro Boxes: A Yummy Meal On-The-Go. 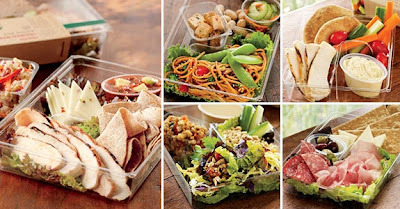 Starbucks Bistro Boxes: A Yummy Meal On-The-Go. We've all been there. You're running late/ You have a deadline/ You're kids have to be somewhere--and in the midst of it all, you're STARVING! Well Starbucks now has a healthy alternative for busy people on-the-go. Bistro Boxes are wholesome balanced meals that are ready to eat--making lunch time fast, easy, and delicious! I went to Starbucks to try out their Bistro Boxes (as if I needed an excuse to go to Starbucks) and was pleasantly surprised by their selections: Sesame Noodles, Tuna Salad, Salami and Cheese, Chicken Wraps, Chicken & Hummus and more! The meal was actually better than I thought it was going to be. Usually per-packaged meals are a bit on the bland side, but this meal was seasoned just right. The chicken had a nice little kick--but not too spicy. The lime cilantro slaw was delish, and the avocado salsa tied everything together perfectly! The only thing I didn't eat was the cheese just because I don't like pepper jack, it's not my thing. Overall, the meal was just right. Filling, but not heavy and with only 380 calories you really can't beat it! By the way did I tell you that the meal includes a piece of dark chocolate for dessert to satisfy our sweet tooth? Yup, pure awesomeness. I'll definitely be back to try more, next time though I think I might try the Chicken Lettuce Wraps. Yum! Have you given Starbucks Bistro Boxes a try? I was just at Starbucks checking out these meals and thinking they should make these available on flights! They look yummy! They should make Starbucks available in flights, PERIOD! Although there's usually quite a few in airports anyway. If they sell bistro boxes there you can just bring them on board with you! Your after reading this I thought I go try it and it was good thxs.